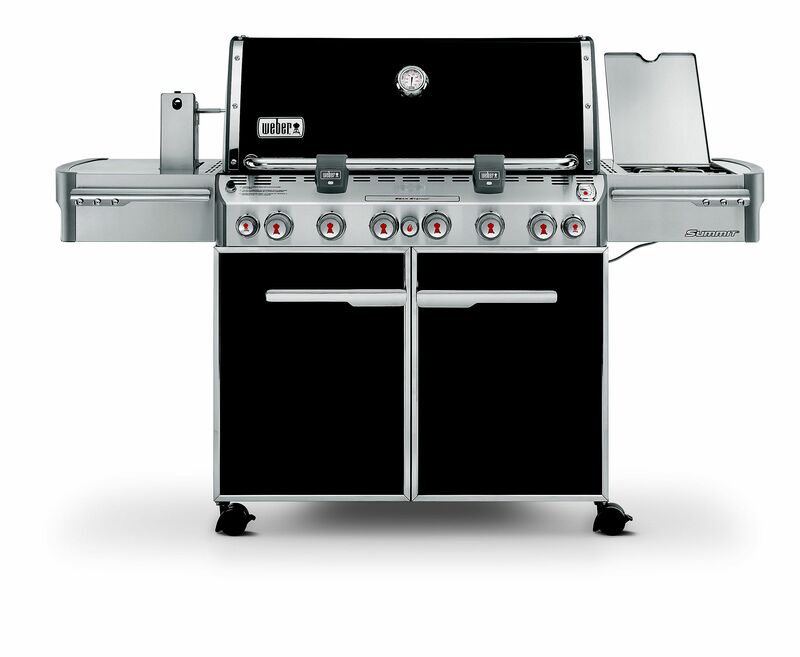 The Weber Summit E-420 is a high-end liquid propane gas grill that comes loaded with unique and sophisticated features, perfect design and excellent performance. The grill can cook your food to excellence and even the expert grill master will appreciate what they get with the grill. The grill comes assembled, so you don’t have to worry about putting it together. Moreover, the grill has been reasonably priced, thanks to its medium size. It lets you feed a family or group of 7-8 people at the same time. Also read: Weber Genesis Vs Weber Spirit. Weber has used high-grade stainless steel to construct the E-420. The overall structure, working and cooking surfaces and design of the grill has been constructed with stainless steel. This is the reason why Weber is popular for manufacturing highly durable grills. You can use this grill continuously for more than a decade without it creating any major problems. The Summit E-420 comes fitted with 4 stainless steel burners that together give out 48,000 BTU per hour. The grill also boasts a 12,000 BTU side burner, meaning that you can easily cook many foods at the same time. The good news is that the heat output from the burners is very intense, consistent and even, which means that your food is going to be cooked to perfection. Weber is popular for the attractive design of its grills, and the same is reflective in the E-420. The grill’s immaculate design, fine finishing and perfect touches are visible to the naked eye. No doubt, you would love the grill so much that you would retain it as a piece of art even decades after you purchase it. The primary cooking surfaces measures 538 square inches. Even better, the grill boasts a 112 square inches warming rack where you can store your cooked food until you are ready to serve. Remember, you’d be required to use a propane tank to make this grill operational. The tank does not come in the package, so you have to purchase it separately. To keep track of the fuel, the company has added a fuel gauge in the E-420. Moreover, the control panel has been shifted to the front and you can manage the heat intensity and evenness with the push of a button. To store your propane tank, the grill comes with a built-in propane tank storage area. The Summit E-420 mostly comes assembled, as do other models in this series. However, you would still be required to put together few parts and components that come unassembled. The grill is heavy, so you should ask someone for help to move it to the location where you want to do grilling. Once at the spot, all you have to do is set open the hard packaging and take out the grill. You will also get a user instructions manual with the grill, so make sure to read it completely before mounting the remaining parts on the grill. If you face any difficulties in assembling the parts, contact the Weber customer support and they’d arrive to your help. Loaded with sophisticated features, the E-420 can make your cooking experience fun, easy and pleasant. We are sure that you can’t stop appreciating the grill’s performance. The Flavorizer bars can give your food a smoky flavor whereas the cooking surface is large enough to cook food for a large group. Operating the grill is very easy and user-friendly. The features like Snap-Jet ignition system, the fuel gauge, warming rack and cooking grates with high heat retention capacity can further enhance your cooking experience. This grill is perfect for you if you have a passion for searing steaks or cooking turkeys. Moreover, the grill comes fitted with six tool hooks that you can use to hang your cooking tools. If you are cooking in the night, the battery-powered light will give you enough light to cook without any difficulty. The good news is that you can clean this system with ease because the cooking and working surfaces are smooth. If you decided to buy this grill, you can buy the E-420 at a discounted price on Amazon with free shipping. You may as well want to check out gas grills under 300 here. What Makes Up A Good Drill Press For Woodworking?